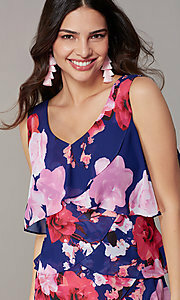 This short floral-print wedding-guest dress will have you heading into spring social events in style. In silky soft chiffon, this little purple party dress blooms with a multicolored floral print from neck to hem. In a short shift style, this sleeveless v-neck party dress features flirty tiers that ruffle down the front in a tulip fashion. At under $100, this floral-print wedding-guest dress is also picture-perfect for the derby, a night out with friends, or a family celebration.